Hail to the PSL. It wouldn’t be fall in this country without it. For each of the million worshipful facebook posts or instagram hashtags raising a toast in its honor, there’s a meme on some other corner of the web decrying this classic beverage as the quintessential “basic white girl drink” (still deciding whether I should be offended by that) …OR… shaming it as a toxic, fake-food sugar bomb. 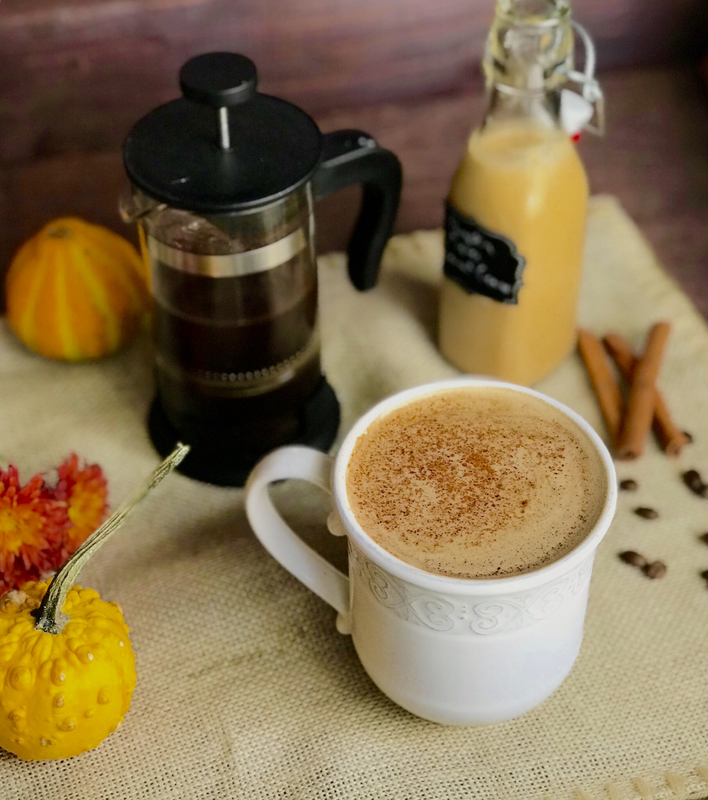 Without standing my ground amongst either the lovers or the haters, I do believe that we can REDEEM this fall-themed concoction, so that it’s neither contributing to conspicuous consumption, nor to artificially flavored sugar addictions. Recently my husband and I took our annual “Fall Day”, splurging on overcommercialized, nostalgia- and artificial flavor-filled fall drinks (yes, the very same which the memes mock), and spent the whole day walking through the woods and nice neighborhoods reveling in the brilliant displays of nature’s artwork. But next year…I’m making my own PSL and taking it on the road. Because it’s just that good. Seriously…it’s better than the overly sweet, fake flavored, give-you-a-headache stuff that I pay $6 for once a year on our “Fall Day.” I’d rather save my $ and buy oils anyways. 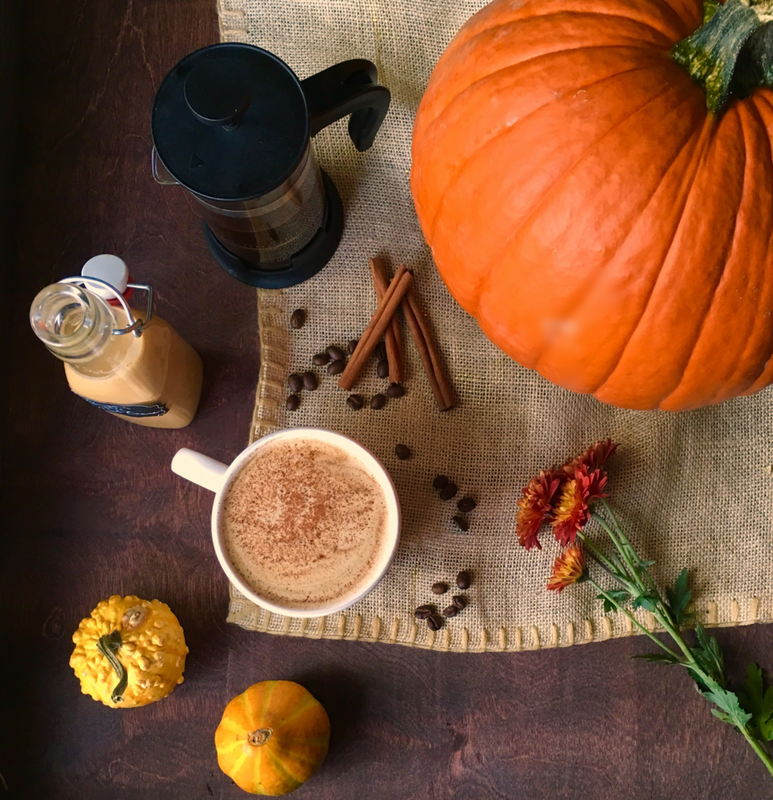 Behold: the real, liberated, and yes, even paleo …Pumpkin Spice Latte. 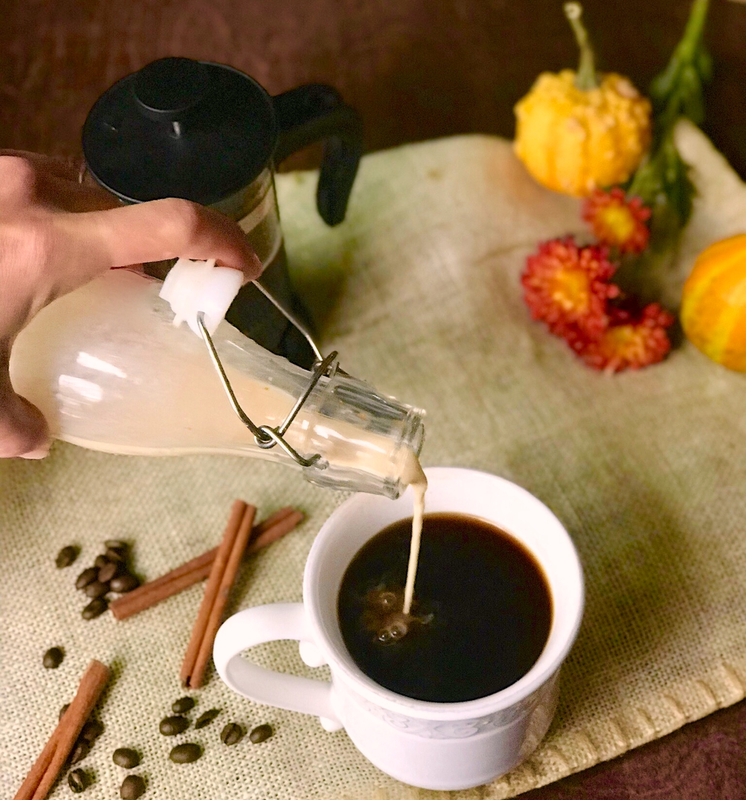 Making a similar-tasting drink without the help of artificial flavorings is a bit tricky if you’re just using ground spices. Either the flavor won’t be very noticeable, or, you’ll have to add so many spoonfuls that the creamer will be gritty and taste a little muddy. …and a “verifiably-better-than-Starbucks” version that takes about 2 more minutes to make… but is WORTH it. It’s made with coconut sugar, which has a lower glycemic index than sugar and gives the cream a rich, caramel taste without any help from a laboratory. Mix the vanilla and oils together in a large jar or Pyrex bowl. Add coconut milk (see note below) & pumpkin, stir really well, and put in a fancy 8oz flip-top bottle or Mason jar. NOTE #1: For the canned coconut milk: use full fat, but since it separates & solidifies in the can, run under hot water for a few minutes, then shake well to incorporate. NOTE #2: For the toothpick dip of Ginger: 1 full drop of Ginger oil for 8 oz is too potent! So to get a 1/2 a drop of oil, just tip the oil bottle so a drop gathers at the opening. Soak the end of a toothpick in the drop, then drop the toothpick into the mixing bowl. Remove after stirring well. NOTE #3: For that coffee-shop-foam effect, use an immersion blender or frother in a tall jar to whisk a little hot coffee with 1 Tbsp of coconut oil til frothy, and pour on top of the mug. Dust with cinnamon. NOTE #4: Enjoy within 10 days. No preservatives or shelf-life-extenders here. Obviously, keep it in the fridge too. Add the 2/3 c of lite coconut milk to a small saucepan over low heat. Slice open and scrape out the vanilla bean seeds, and drop the pods in the milk. Add coconut sugar and pumpkin, and stir till sugar melts; about 2 minutes. Remove from heat. Add oils, mix well, remove vanilla pods and pour into fancy 8oz flip top bottle or Mason jar.